We are proud and excited to announce our new programme in partnership with Build Up. 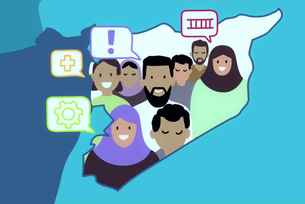 The Digital Steps Fellowship is designed to give new digital strategic skills to Syrian organisations and initiatives who are working to promote peaceful values and diversity to connect Syrians with the world, change how people view Syria and create sustainable work opportunities. The fellowship will support these organisations to gain new digital skills with the aim of helping increase their impact. Training: fellows will come together for a joint, week-long training course on participatory methodologies, user-centered design, strategic communications, creative methods and conflict sensitivity. Mentorship: each organisation or initiative will be assigned a lead mentor who provides project management support, technical advice and hands-on problem solving. The lead mentors are the glue that hold together the rest of the Fellowship components. Coaching: each organisation or initiative will be paired with four coaches who have have skills or experience relevant to their work. Coaches will offer four one-hour calls over the course of the Fellowship to explore questions and share advice. Financial support: fellows will receive financial support to cover some of the technical implementation costs of their initiative. The exact funding amount will be determined on a case-by-case basis depending on the specific needs of an initiative. Deadline to apply is: 11 June.